The ECO mode switch is installed to the instrument lower finisher. When the eco mode indicator lamp on the combination meter is off and the eco mode switch is pressed, the eco mode is active and the eco mode indicator lamp is on. When the ECO mode indicator lamp on the combination meter is ON and the ECO mode switch is pressed, the ECO mode is cancelled and the ECO mode indicator lamp is OFF. 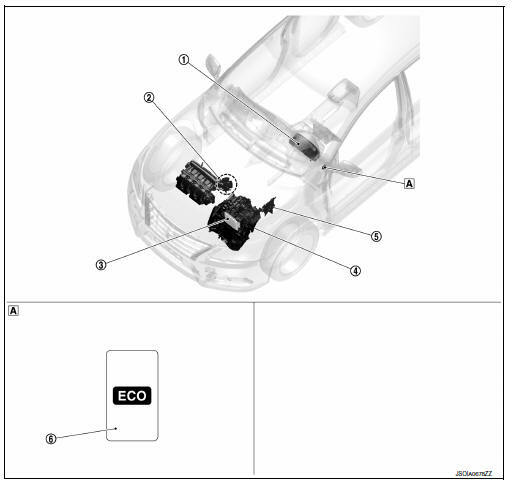 The eco mode indicator lamp inform the driver that the vehicle is in eco mode. TCM receives ECO mode switch signal (ON/OFF) from combination meter via CAN communication. Based on the signal, TCM transmits ECO mode signal to ECM via CAN communication. ECM transmits ECO mode indicator signal to combination meter via CAN communication. Based on the signal, combination meter illuminates ECO mode indicator lamp. When all of the following conditions are satisfied. When any of the condition listed below is satisfied. The eco mode switch is pressed when the eco mode indicator lamp is on. The SPORT mode switch is pressed when the ECO mode indicator lamp is ON. Tcm receive eco mode switch signal (on/off) from combination meter via can communication. Tcm transmit eco mode signal to ecm via can communication according to the signal. ECM transmit ECO mode indicator signal to combination meter via CAN communication. Combination meter illuminates ECO mode indicator lamp according to the signal. For tcm control, refer to tm-104, "eco mode control : system description". For ECM control, refer to EC-52, "ECO MODE CONTROL : System Description".